Before I make any recommendation for my premium income service, Pure Income, there are two metrics I look for in a company: increasing dividends and share buybacks. While these are the two main components of a screen I run, there are other inputs as well, such as earnings and revenue growth, dividend yield, cash flow, etc. But I use the two primary ones — dividends and buybacks — because they are essential to valuating a large company’s operations. If a company can increase dividends and buy back shares, both of which are forms of returning cash to shareholders, then its cash flows are real — not just some number on paper, but tangible cash that is going into shareholders’ pockets. Not every company I recommend has this trait, but the majority do. And right now, the combination of the two may actually be giving a bullish signal for the market. Some investors use the S&P 500’s dividend yield as a measure of whether the market is oversold or overbought. If the yield is above average, the market is oversold; if the yield is below average, the market is overbought. The current dividend yield on the S&P 500 is 2.02%, which is well below the historical average of 3% going back to 1970. And keep in mind, yield has an inverse relationship to price, so when prices are rising, yields are usually falling, and vice versa. The rationale is that if the yield fails to keep pace with a rising share price, then companies are no longer returning cash to shareholders like they once were. There are many reasons a company can slow or even cancel its dividend payment, but the most common is because its operations are not running as smoothly, and more cash is needed to run the company. You can easily see that as the S&P 500 rises, yields decline. With the current dividend yield pinned near 2%, a level that is well below average, it could mean companies are not as confident in their operations. At the very least it means we are not seeing companies increase their dividends at the same pace their share prices are appreciating. So what else are they spending this cash on? Well, when we include share buybacks, we get a different picture. Share buybacks are considered a form of returning capital to shareholders because as companies buy back shares, there are fewer shares to spread earnings over. Therefore, when a company buys back shares, it is essentially increasing its earnings per share, which usually leads to increasing its share price — adding value for shareholders. When you combine capital spent on share buybacks with dividends, we can create what is called payout yield. 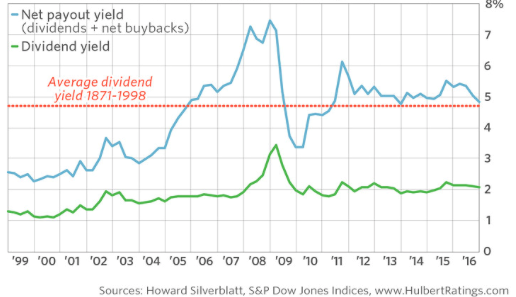 Here you can see the dividend yield of the S&P 500 in green, while the blue line is the payout yield of the S&P 500. The red dotted line is the average dividend yield from 1871 to 1998 — about 4.75%. Granted, this yield doesn’t take into account share buybacks over that time frame, but it’s important to note that the majority of that time, yield was driven solely by dividends, so it’s a fairly accurate reading of yield. 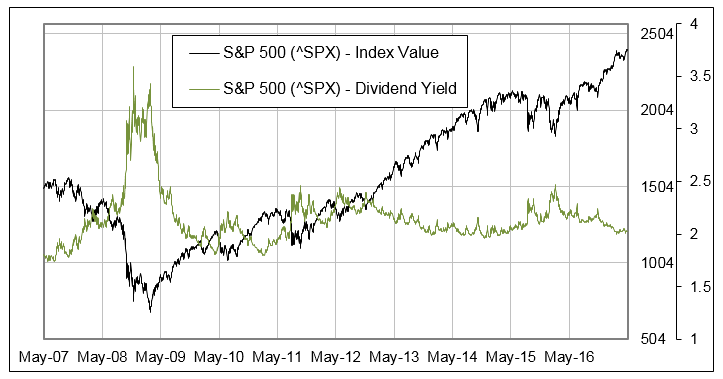 As you can see with the green line, the dividend yield has been well below that the entire time, but the payout yield is showing that stocks may not be as overvalued as the dividend yield portrays. And it clears up what companies have been doing with their cash — they are buying back shares of stock. Neither of these two measurements are a perfect buy-or-sell signal, but they are worth a look when trying to grasp the overall health of the market. And right now, the payout ratio is saying this bull market could still have some room to run.